Volterion specialises in the development and manufacture of the stack, the core component of a Redox-Flow battery. Redox-Flow batteries are electrochemical energy storage devices. They essentially consist of an energy converter (stack) and an energy storage component consisting of tanks filled with electrolyte. Electrical energy is converted into chemical energy during charging in the stack and is stored in the electrolyte. Although different electrolytes can be used, in this application vanadium in various oxidation stages, is used. Vanadium offers high reliability with minimal side reactions. 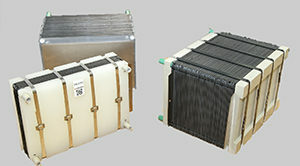 Developed at the Fraunhofer Institute UMSICHT Volterion’s innovative patent represents a breakthrough in design of the energy converter (stack). When compared to conventional energy converters, Volterion stacks are more compact, reliable and cost-effective, enabling the widespread deployment of our products for domestic, distributed and grid-scale energy storage.